This piece started off as what could perhaps be labelled a ‘transit piece’ in the context of the cycle einbahnstraße. This is even (somewhat naively) represented in the work by the transitions in register in the 2 instruments: the piccolo beginning with its very lowest note and always aiming upwards; and the other instrument’s opposite route. But this allegorical transit is constantly unsuccessful; other material breaking through and piling themselves up and what could be simple becomes complex and fragmented. totenkopf exists in 2 versions: for piccolo and oboe or for piccolo and Eb clarinet. Score: Buy score at BabelScores! When approach to participate in the project “Sound Correspondences” I was told that the concert was to be related to a collective exhibition of the CGAC. For me the artist involved is María Ruido who presented her work “La memoria interior” for me. While there may be certain connections between our works (construction of memory would be one), what immediately struck me was the very beginning where, in complete darkness, Nur Stille, Stille (from Mozart’s Die Zauberflöte) is heard. 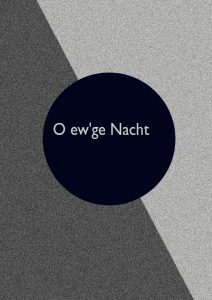 The title of my piece, O ew’ge nacht, is also taken from Die Zauberflöte where it is a short recitative; the topic being that of questions about the afterlife, eternal life, and love. If the recitative is a Message from Beyond, this music struggles, through the performers (as some kind of deformed Papageno and Pamina figures), trying to ask a question. The effect of struggle is twofold, for while the music itself articulates a search through potential material, the player is faced with notation of great complexity from which a performance must be extrapolated. In this sense, the struggle is not only that of the extreme performance situation, but also one of creating a piece of music of any real significance. The title of this work, seals, comes from the Italian philosopher, mathematician, poet, Dominican friar and astrologer Giordano Bruno (1548 – 1600). Although not widely recognized he is celebrated for his cosmological theories, which went even further than the then-novel Copernican model. Bruno also correctly proposed that the Sun was just another star moving in space, and claimed as well that the universe contained an infinite number of inhabited worlds, identified as planets orbiting other stars. Because of his, at the time, radical thinking (including supporting Galileo Galilei) Bruno was forced to leave Italy in 1576, first to France and later to England and Germany. In 1591, in a time when the Inquisition seemed to be losing some of its impetus, and Venice seemed especially safe as it was the most liberal state in Italy; therefore Bruno was lulled into making the fatal mistake of returning to Italy. In 1592 he was arrested by the Venetian Inquisition, sent to Rome and charged of blasphemy and heresy. After 7 years of trial the Inquisition found him guilty, and in 1600 Bruno was burned at stake in Rome’s Campo de’ Fiori. Bruno’s case is still considered a landmark in the history of free thought and the future of the emerging sciences. So, 30 seals (Triginta sigilli) and the seal of seals (Sigillus sigillorum). What then are these seals? The art of mnemonics tradition, e.g. Fra Agostino del Riccio’s work Arte delle memoria locale (unpublished, but the manuscript exists in the Biblioteca Nazionale in Florence) uses the idea of presenting the principles and various techniques of the art through little symbolic pictures, with titles. This is exactly what the Seals are, statements of the principles and techniques of the art – but, magicised, complicated with Lullism and Cabbalism, blown up into inscrutable mysteries. The seals are not confined to any one system. On the contrary Bruno states that he is trying every possible way; perhaps something for which he is not looking may emerge out of this, as alchemists who do not succeed in making gold sometimes hit on other important discoveries. In the later Seals he is trying variations of astrological arrangements, devices of a Lullist nature (or what he supposes to be Lullist), infiltrations of Cabalist magic in the unending search for a really operative organisation of the psyche. And the search always brings in the tricks of the memory trade, the old techniques of which can be recognised in Seal after Seal, though now presented as occult mysteries. If we drop the word ‘magical’ and think of the efforts of an occult memory artist as directed towards drawing out of the psyhe combinations of ‘archetypal’ images we come within range of some major trends of modern psychological thought. There is something, to my mind, profound in the Seals, as though in its inner moulding of significant memory statues, this drawing out of tremendous forms by subtraction of the inessential, Giordano Bruno, the memory artist, were introducing us to the core of the creative act, the inner act which precedes the outer expression. 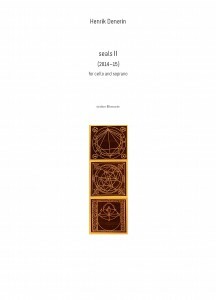 The work seals II is one of eleven works for solo instruments which form cycle III of “synthetic fragments”. 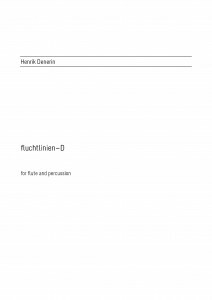 fluchtlinien-D is fluchtlinien with a structured improvised percussion part. fluchtlinien – With this concept Deleuze and Guattari points at possible alternatives to the dominating approach. One example is how the music sends out lines of flight (fluchtlinien) when it multiplies and spreads like a diverse weed of sound. Fluchtlininen thus indicates the potential for something different to take shape, for example, the opportunity of re-thinking. Every form of life – a body, a social group, an organism or even a concept – consists of links and connections. Genes come together to form cells; cells are collected to form tribes. 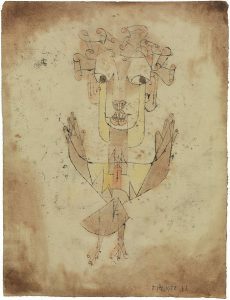 The term ‘human being’ is an example of such an interconnection of reason, a certain type of body (white, male), speech, and so on. But every connection also allows a fluchtlinie; there is always the potential for genetic mutation. The definition of man as rational also enables a dispute about what constitutes humanity: e.g., is it rational to put up a stock of nuclear weapons? Thus, every definition wears, every territorialisationtorium or body, the opportunities that opens up for a fluchtlinie that could turn it into something else. With this concept Deleuze and Guattari points at possible alternatives to the dominating approach. One example is how the music sends out lines of flight (fluchtlinien) when it multiplies and spreads like a diverse weed of sound. Fluchtlininen thus indicates the potential for something different to take shape, for example, the opportunity of re-thinking. breathing for prepared cello is the last section (section 10), but the first to be composed, from a much larger work for cello, electronic music and visual performance. 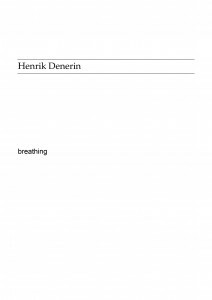 Performed as a solo piece, breathing does not utilize any electronics or video. The music isn’t intended to illustrate any kind of breathing but to be in itself the “breathing”, in the large scale work as a re-wakening and as a solo piece, the enjoyment of life (breathing gives life!). Structurally the work as a whole and down to its very details is influenced by prime numbers. The reasons for this are manifold. They grow like weeds among the natural numbers, seeming to obey no other law than that of chance, and nobody can predict where the next one will sprout. The second fact is even more astonishing, for it states just the opposite: that the prime numbers exhibit stunning regularity, that there are laws governing their behavior, and that they obey these laws with almost military precision. The stability of the structure, its symmetry and beauty, is the way in which the understanding takes its perceptible form and communicates itself to the listener… to understand something about the material and how, conceptually, music communicates itself to the listener. 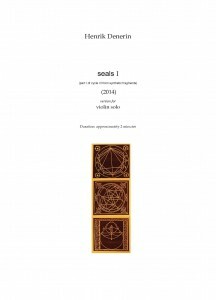 The work seals I is one of eleven works for solo instruments which form cycle III of “synthetic fragments”. parts are performed consecutively. It’s also possible to perform each movement individually. THE TIME WITHIN explores different relations between time (duration – horizontal) and sound complexes (vertical – group formations – chords). 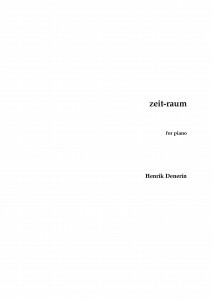 It is composed with the help of IRCAM’s open music. I made a set of rules for how the piece should be formed, variations of application of duration to n notes and a initial probability that certain phenomena should appear or not (e.g. how sound complexes should be formed… completely vertical or in group formations, ornaments etc.). I, so to speak, show the direction of the piece to the program whose function is to map out this direction. One thing that became interesting to me, except the result itself, was to observe how a computer went from being a recalcitrant tool (or maybe my reluctance against the computer) to “open up”. An initial musical object; passing through a sort of passage which continuously rotate and transform it. The path over which the approach is made are, in a sense , arbitrary; and could obviously be many, with passage suggesting a number of possibilities; but it tries to be mobile – always moving towards the centre and searching for a material that is both a flickering interplay of surface gestures and trying to sink below the surface. Arriving at a musical ‘plateau’ the focus has shifted; with the material becoming ‘static’, as it were, exploring time domains. Objects which are folded with memories, breaking time. As the time is speeded up, the material starting to rotate, we move towards the passage once again, with new suggestions, a passage variation, trying to move, successfully or not, from the centre towards outer space. Tautology – The common tendency is obvious enough, but it is also a narrative in the sense that its language is directly related to states of consciousness of a first-person narrator. The text can be read as a metaphor for life: as a movement toward the unknown point of death. Another aspect reveals itself in the inescapable impression that the totality of the text is apprehended like fragments out of a context that cannot be reconstructed and for whose existence there is no evidence in what is literally said. Certain formulations arise that elicit unreachable memories, as it were, memories of contexts that cannot be reconstructed. So, content, a story after all? As little of this as of purely abstract composition. A little of both. 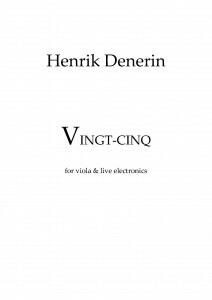 VINGT-CINQ is dedicated to Gertrud Heinerud and was written for her 25th birthday.